You can reach Vilanova from the airport in two different ways, by bus or by train. 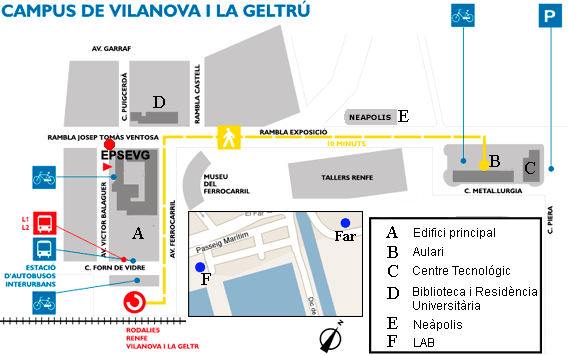 There are buses which go to Vilanova i la Geltrú. Check the timetable and prices here. You can take the train from the airport to El Prat de Llobregat, then change trains (at the same track) to Vilanova i la Geltrú. Check the timetable and prices on the Renfe website. You need to take a bus to Barcelona Estació del Nord (single ticket €16). You can find more information on transfer options here. Then walk to the metro station Arc de Triompf and buy a metro ticket to Passeig de Gracia. Make sure you buy your ticket at the red machine in the back on which it says ´TMB´. Take the metro in the direction Hospital de Belvitge (L1, red line) and get out at Catalunya. There you change to the metro in the direction Trinitat Nova (L3, green line), get out at Passeig de Gracia. At Passeig de Gracia you can buy a train ticket and take the direct train to Vilanova i la Geltrú. EPSEVG can help you to find a place to live. Most of our international students live in shared flats with other students or stay at the students’ residence. Places are very limited; if you want a room here you must apply early. The cost is around 400 euros monthly for a single room and 250 euros for a shared room. This includes a room with a kitchenette, bathroom facilities, a Wi-Fi Internet connection, study rooms and a weekly cleaning service. It does not include electricity, which is approximately €10 extra per month. If there are no rooms available in the residence, you can try to find your own accommodation. We will help you with this by providing you with a list of flats which are privately rented and have been vetted by us. Remember that not everyone speaks English so be prepared to use your Spanish or get in a Spanish speaking friend to help. The cost of a room in private flats ranges from €200 to €400. The library, located opposite the main building of the EPSEVG offers books, documentation resources and services for studying, teaching and research purposes. Free access to all the material is available except for those documents such as final theses and the antique collection located in the library depository. The digital campus is an online system for students and teachers of the School of Engineering. Teachers can post documents students need on the Digital Campus. Students can also communicate with teachers via the digital campus. After being registered at the university, you will receive a username and password to access the digital campus. There is Wi-Fi access throughout the campus. On registration students are given a username and password which enables them to use the network. Five rooms are available where this free access can be used. There is an IT helpdesk available to help you with problems of technical nature. All laboratories are located on the first floor. The UPC offers Spanish and Catalan courses for exchange students. These courses are offered at the main campus of the UPC in Barcelona. EsportsUPC and the Student Delegation organize different cultural and sport activities in Vilanova i la Geltrú for the students. Vilanova i la Geltrú is a pleasant coastal town, located about 50 kilometres south of Barcelona with a population of around 66,000. Its busy town centre and bustling market are worth a visit just as its old quarter, church and theatre. 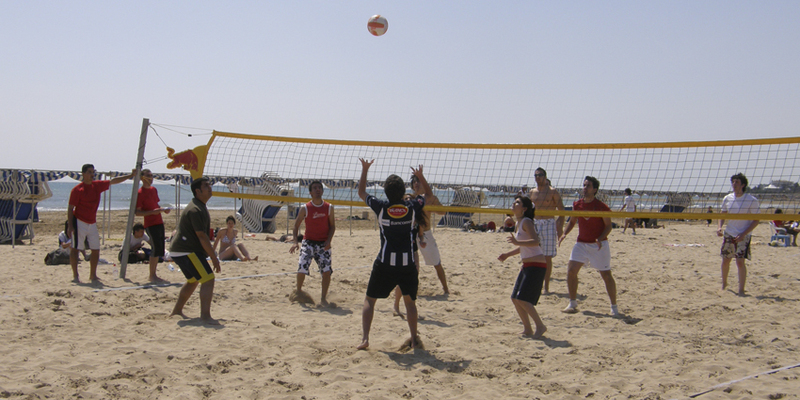 The beach promenade, lined with coffee shops and bars offers an ideal place to go walking or jogging and the beach itself is the starting point to practice many of the water sports available- sailing, windsurfing, canoeing, etc. Most people in Vilanova i la Geltrú speak both Catalan and Spanish, but they barely speak English. As a result it won’t be easy for you to communicate unless you have previous knowledge of Spanish. Oficina de Turisme de Vilanova I la Geltrú.